A1A Dock Products 5 Step Wide Step Lifting Dock Ladder, Wide 3.5" Steps, Aluminum. FREE SHIPPING! 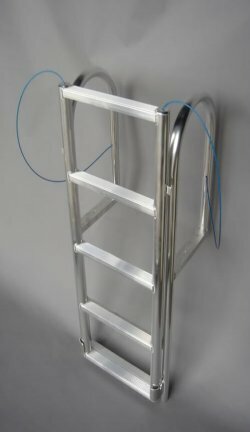 5 Step WIDE STEP Lifting Dock Ladder, Wide 3.5" Step, Aluminum. Comments: Exactly what I wanted and more than I expected. I would recommend the 4" steps. Comments: I ordered the 5-step lifting ladder with the wide steps. It was actually very sturdy and easy to install on the dock. My only complaint is that it should come standard with a catch to lock it in the up position.